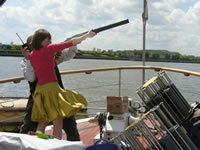 A new and unique event based in the heart of central London to shoot clay pigeons from the decks of one of the country’s most important historical boats, now gleaming following an extensive refit. Your shooting event will take place on board this beautiful 85’ motor yacht, former flagship of the Port of London Authority and renowned for carrying the coffin of Sir Winston Churchill during his state funeral in 1965. The yacht has a comfortable saloon but the main feature is the large open aft deck, which is perfect for viewing with smart seating and a substantial awning, giving shelter from both sun and rain when required. Your event will start at St. Katherine’s Pier by Tower Bridge for a cruise down the river and through the Thames Barrier to the shooting areas at Thamesmead. After expert tuition and a fun morning of shooting clays, the chef will serve delicious hot food freshly prepared aboard the yacht. Enjoy a selection of canapés followed by two hot main courses made easy to eat by being served in individual Japanese style bowls! Enjoy a half or full day programme. Please talk to us about the different formats of the event so that we are able to produce a schedule that matches your requirements and the time you have available. If your arrival time is before lunch, then we suggest Danish pastries with tea and coffee to be served on arrival. Please note that we do not serve alcohol until after the shooting event has taken place. Whilst aboard, soft drinks, hot drinks and snacks are served throughout the day. If specified, we are also happy to serve beers, wines and other drinks. The yacht has a full alcohol license. 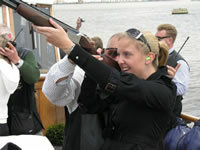 The price includes the use of the guns, steel rather than lead shot and biodegradable clays. The event is covered under license and the price includes full insurance. Once off the water, we have the option to continue the party atmosphere ashore in a waterside restaurant that provides a perfect venue to run into an evening meal or BBQ if desired. Catering requirements are an additional cost such as breakfast, lunch and alcoholic drinks. Please call our sales department for assistance.